The Georgia Bureau of Investigation compiles annual crime statistics using a method based on the FBI’s national reporting system. This database focuses on serious felonies and the rates of arrest and conviction for each. Let's look at the most recent report (Editor’s Note: Data for 2018 had not been compiled at the time of this writing). For the 28-county Atlanta metropolitan statistical area, incidents of murder were highest in Fulton (124 murders), DeKalb (98 murders), and Clayton County (44 murders). DeKalb (2060 aggravated assaults), and Cobb County (1089 aggravated assaults). 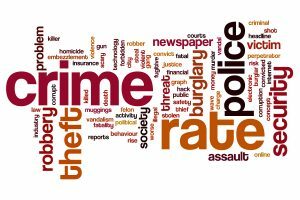 For burglary and larceny, rates were highest in Fulton (6235 burglaries and 33,652 larcenies), DeKalb (6000 burglaries and 20,853 larcenies), Gwinnett (3342 burglaries and 13,152 larcenies), and Cobb County (2540 burglaries and 13,619 larcenies). Robbery rates were highest in Fulton (2354 robberies), DeKalb (1535 robberies), and Gwinnett County (803 robberies). These rates also represent highs for the state of Georgia. If these numbers seem high, there is a bright side. Crime reduction continues to be a high priority in both the Georgia State House and Governor’s Mansion. The home security company Safewise recently ranked the safest communities in Georgia and found Summerville, Milton, Johns Creek, Senoia, Peachtree City, Alpharetta, Tyrone, Dallas, Flowery Branch, and Grovertown to be the safest communities in the state. Remember that if you’re arrested and charged with a crime, an experienced and licensed bail bondsman is your best ally. At Bond James Bond, we pride ourselves on our professionalism, courtesy, and attention to detail. Don’t miss valuable time away from work and family. Contact us and discover what Bond James Bond can do for you.